.......TURNS OUT IT ISN'T CHEAP, EITHER! As you have read in a previous post, Jim has his quirks about recycling cans. I have my own quirky ways. This is not news to anyone who has known me for more than 3 minutes. Last summer, I learned a wonderful way to fold plastic bags. I went to a yard sale at Neighbor X's house, made a purchase, and was blown away when Neighbor X whipped out a perfectly folded, flat, compact grocery store bag! She graciously gave me a lesson in bag folding. I used the technique rather half heartedly until about a month ago. One winter day when we were snowed in and I was feeling quirky, I decided to redo all the saved plastic bags stored in our little milk can. I sure wish I thought to take a BEFORE picture to show you, but.....too little, too late, as they say. Take my word for it; the can was jammed to the rim. Want your supply of plastic bags to look this good? It's really easy. . . . .
1. Work on a flat surface. Flatten the bag, taking care to tuck in the pleats neatly at the bottom. Use your hand to smooth out any air, working from the bottom of the bag to the top. 2. 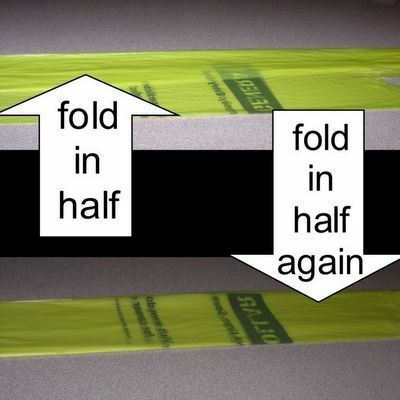 Fold the bag in half lengthwise and again smooth out any air. 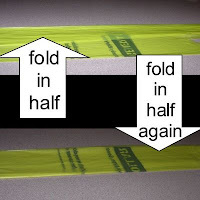 Fold in half again, lengthwise, and smooth out any air. Are you getting excited yet? You may want to have a party to show off your supply of folded grocery bags!! 3. Starting at the bottom, fold lower two to three inches of the bag up, repeating until you reach the handles. This can be used on grocery bags and bread bags. What? You don’t save bread bags? There are tons of ways to use bread bags to save money! And I’m not talking about cutting them into strips and crocheting them into a rug. You can do that…..but I’m not going to! Speaking of money, I read a John Stossel editorial this week about GREEN JOB FANTASIES. Look it up on his website. This is an eye opener! Frankly, the only reason I’m interested in putting things in our recycle bin is that it saves me personal money. Sorry to all you green people out there! I’m for the at-home bottom line! 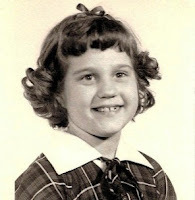 I learned that bag folding from a little old lady at Mother's Assisted Living yessiree--------ARE YOU KIDDING????!!!!!! It's just too easy to stuff them in one giant plastic bag, lazy man style.